This is a supplement kit provided by California State Parks Foundation contributors Erland Sanborn and Greg Zelder, for a presentation they delivered at Summit 2011 titled “Augmenting Convio & Common Ground with Salesforce and Apex”. 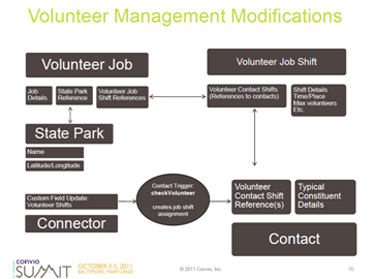 They created custom code and other modifications to extend the functionality of volunteer management within Convio Common Ground. You will find in this zip archive a README file to get started, sample code, and a copy of the presentation slides.